A lovely 2 bedroom ground floor apartment (sleeps 4) with private garden, UK TV, WIFI & air-conditioning. Lovely ground floor apartment for 4 people with private garden and resident’s pool in Javea, Costa Blanca, just 400m to the sandy beach. 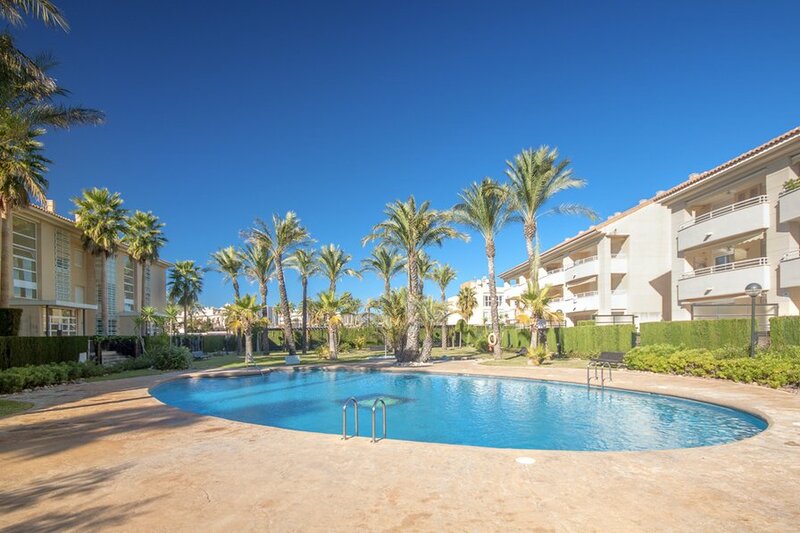 This ground floor 2 bedroom apartment has a large private terrace/garden area and direct access to the resident’s pool and gardens so is ideal for families with children able to play on the complex unsupervised and who can freely come and go. 2 sunbeds are provided and there is an outdoor table and chairs to eat al fresco. Located in the heart of the Arenal sandy beach area, near the shops, restaurants and bars, shops and cafés, Golden Beach is ideal for those not wishing to use a car while on holiday. There is a good supermarket just around the corner and just a 5 minute stroll from the sandy beach. The apartment complex is located ia short walk from the sandy beach area which is brimming with restaurants, bars and shops. You don´t need a car whilst you are there but you may find it handy for getting to and from the airport and if you do wish to explore further afield.